The panelists, including Dr. Oparah, discussed the affordability of higher education. 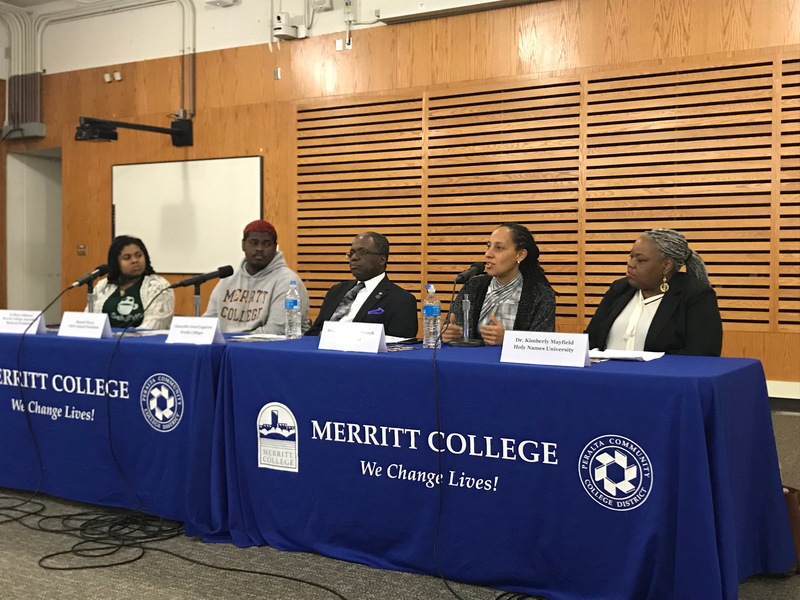 On Feb. 8, the KQED Community Action Panel hosted an East Bay Community Conversation at Merritt College to discuss the affordability of pursuing higher education in California, which is ranked the second most expensive state to live in by CNBC. This dialogue is the first of a two-part series. The panelist of higher education administrators and students consisted of: Dr. Chinyere Oparah, Provost and Dean of Faculty, Mills College; Dr. Jowel Laguerre, Chancellor, Peralta Community College District; Dr. Kimberly Mayfield, Dean, School of Education, Holy Names University; Montel Floyd, Merritt College Club Council President; and Ya’Mese Johnson, Associated Students of Merritt College President. In addition, District 6 Councilmember Loren Taylor made an appearance to deliver the opening statement. College affordability is an increasingly substantial concern in the United States. The Pew Research foundation found in 2018 that 63 percent of Americans see college affordability as a “very big” national problem, up eleven percentage points since 2016. In California, community college is considered an affordable post-secondary education option, focused on general education courses that builds a bridge to a four-year institution. Laguerre noted that tuition at the Peralta Community Colleges is $46 per credit and there is an open admissions policy, making this an accessible decision as well. Other benefits to attending a community college include opportunities to begin interacting with professors and acclimating to college life. The Peralta Community College District operates four community colleges in Alameda County: Berkeley City College, College of Alameda, and Laney College and Merritt College in Oakland. Since 2017, the California College Promise (AB-19) makes the first year of community college tuition free for first-time students enrolled in twelve or more credits, which is considered full-time. Then, in Dec. 2018, the California Legislature announced Assembly Bill 2 (AB-2), expanding the California College Promise to waive tuition for two years or the estimated time to obtain an Associates Degree. “That is going to be super helpful. I think with stats that are going to come out it’s helping 20 percent more students. So there’s a 20 percent decrease in the amount of students that are going to be in debt when it comes to paying tuition,” Johnson said. California Governor Gavin Newsom has included funding for AB-2 in his 2019-2020 fiscal year budget and it is awaiting expected approval by the Legislature. Mills has also made agreements with UC Berkeley and the Peralta Community College District. Students at both UC Berkeley and Mills can cross-register for classes at either institution. Then students at a Peralta Community College can pursue both their associate and baccalaureate degrees at Peralta and Mills. “What we know about the United States is that there is a racial wealth gap. … So for an institution like Holy Names, who is committed to educating diverse students, that means we also have to be dedicated to bridging the racial wealth gap by offering financial support so that students can get the high quality rigorous education we offer in the Catholic tradition,” Mayfield said. Holy Names University (HNU) offers discount rates based on student factors, such as need and merit. It also has community based projects, including their Early Admit Program that helps freshmen from the Oakland Unified School District (OUSD), Oakland Catholic Diocese Schools or the West Contra Costa School District complete the UC/CSU A-G Requirements and, upon meeting other requirements, gain guaranteed admission to HNU and financial aid. Mills also has policies and procedures designed to make a private education attainable. For example, in Sept. 2017, the college reduced undergraduate tuition by 36 percent. In addition, beginning Fall 2018, the Mills Promise Program awarded scholarships to students based on their GPA from the Oakland Unified School District (OUSD) toward their Mills’ education. Oparah shared that this is expanding to include Berkeley, Contra Costa and Alameda counties. First-generation undergraduate students, in particular, tend to face challenges completing their degree. The National Center for Education Statistics reported that this is due to being unable to benefit from parental college experience. The Mills student body is thirty-nine percent first-generation undergraduate students for the 2018-19 academic year. “It takes a disorganized community, but a loving community, to make it happen. When I say disorganized, I meant that we don’t all come together to make it but different persons here and there make it happen, and it’s important for us to know that somebody else had an influence on what we are so that we don’t forget and that we try to also be an influence in the lives of others,” Laguerre said. 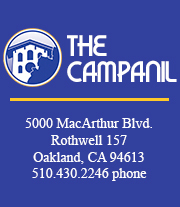 To help counter college dropout rates, Oparah told the audience about the Mills Promise Program’s Oakland Unified Leadership Academy, a summer bridge program for Oakland Unified School District (OUSD) high school students entering Mills in the fall. This program offers mini-courses and seminars focused on academic tools needed to be successful in college. Both the HNU Early Admit Program and Mills’ Oakland Unified Leadership Academy also provide high school students the opportunity to start engaging with college faculty and making friends. She pointed out it is important to remember that there are non-first-generation students that can understand the first-generation experience, because perhaps their parent was the “trailblazer.” For students from multiple-generation of college alumni, Oparah recommended introducing first-generation students to some of their possible added resources and networks. “Perhaps they have more experience of navigating some of the systems here at Mills. They can help with that. I have to say that I do see our seniors and our juniors helping other students who are newer to the campus in that way too,” Oparah added. 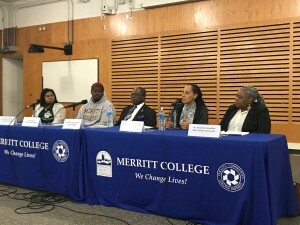 The second part of the KQED East Bay Community Conversation, discussing higher education and attainability, is being hosted at Mills College on March 20 at 1:30 to 3:30 p.m. in Lorry I. Lokey School of Business and Public Policy Gathering Hall.